Jacob Cochran owes his love of fishing to his grandfather who took him fishing for catfish bait back in rural Ohio. Cochran, now a graduate student in Buffalo State’s Great Lakes Ecosystem Science (GLES) master’s program, has added the Niagara River to the list of places he loves. “You start to become passionate not just about your research but also about the ecosystem you’re doing it in,” he said. Cochran is one of five graduate students currently working on the Emerald Shiner Habitat Conservation and Restoration Study; a sixth begins this semester. The project, funded by the Niagara River Greenway Commission, is headed by research scientist Alicia Pérez-Fuentetaja, associate professor of biology and principal investigator (PI) for the project. Randal Snyder, professor of biology, is co-PI along with Mark Clapsadl, research scientist with the Great Lakes Center and manager of its waterfront field station. The purpose of the project is to learn more about the emerald shiner, a small fish that’s a critical part of the food web in the Niagara River. Cochran, with fellow students Steven Fleck, John Lang, and Christopher Osborne, are pursuing their own graduate research while contributing to this study. “Chris, John, and I do a lot of the boat work for the shiner project,” said Cochran. “We’ve used electroshocking and seining to sample fish populations from Strawberry Island to the northern tip of Grand Island.” Such sampling provides information about the size, weight, body shape, genetics, and reproductive health of the fish. Fleck and Lang are analyzing the diet of the emerald shiner. Lang is also researching emerald shiner morphometrics—measured differences in body shapes—for his own research, while Osborne is studying the shiner’s reproductive efforts. 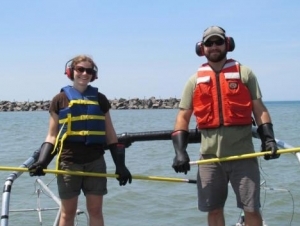 Graduate student R. Josephine “Jo” Johnson serves as the outreach specialist for the project. She maintains its website, Facebook page, and Twitter account and conducts community presentations. Johnson, a first-year student in the GLES master’s program, is considering the subject of her own research project. “I’d like to research immune system responses of the emerald shiners to sewage pollution,” she said. “Our graduate students are an invaluable part of this project,” said Pérez-Fuentetaja, “along with our research collaborators.” The New York State Department of Environmental Conservation, the U.S. Army Corps of Engineers, the Ontario Ministry of Natural Resources, Buffalo Niagara Riverkeeper, the University at Buffalo, and the Bioinformation Institute at Virginia Tech are contributing to the project.